ProBed has created a BETTER way to care for the immobilized individual! 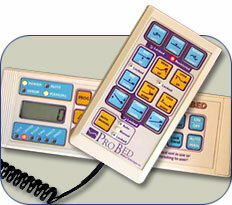 The Freedom BedTM is a unique, computer-controlled, therapy system that manually or automatically turns the bed-user to different stable sleeping positions without the aid of caregivers or institutional staff. The bed closely mimics the body's natural nocturnal motion by mechanically repositioning it in order to re-establish blood flow to compressed tissue and thus prevent the formation of life-threatening bedsores and other complications of immobility. The motion is timed (rather than random) when under computer control and the rate is adjustable to permit the accommodation of a wide variety of sleeping patterns. Clinical studies and testimonials confirm that the ultimate benefit of the Freedom BedTM is better health and an improved lifestyle for bed-users and their caregivers. How does The Freedom BedTM work? The horizontal surface of the bed that supports the mattress is hinged into three longitudinal sections. The user of the bed is positioned on his/her back in the centre of the three-part platform (the sleeping platform). As the bed smoothly and quietly rotates to one side the outer section of the three-part platform on the lower side turns up to form a “wing” which supports the body along its entire length from the ankle to the shoulder. Thus the bed-user is carefully cradled by the bed’s structure to prevent sliding and shear forces that can increase the potential of developing bedsores. Any pressure transferred to this side of the user is thus dispersed along the entire frame of the body. The wing on the upper side of the platform lowers during this process to properly balance the entire platform and provide integral strength throughout the structure. As the bed reverses the rotation the lower wing rises as the higher wing lowers so that, at the horizontal position, all three sections of the platform are horizontal. The bed then automatically rotates to the other side to complete the cycle. The design of the bed allows for the turning of the user along the spinal axis that creates a minimal feeling of rotation (turning). The slow rate of rotation, combined with the smoothness and quietness of operation, allows the user to enjoy uninterrupted sleep throughout the night. Another feature unique to The Freedom BedTM is the air-powered head and leg raising system that allows the user to be raised into the sitting position. The system is unique in that it can be adjusted to meet the requirements of each individual user of the bed rather than being built to accommodate the “average” person. The key benefit of the design is the low-pressure air cushions under the mattress that raise the user. These cushions of air conform to the user's body shape, and provide a complete range of ergonomic positions. This also minimizes pressure under the sacrum thus reducing the risk of pressure sores developing while elevated. A key feature of the Freedom BedTM is its ease of operation. User-friendly control panels allow caregivers to easily program the bed for automatic use or to adjust any of the bed’s operations manually. Changing the operation of the bed from automatic to manual or from manual to automatic is a one-step procedure. Additionally, different styles of override buttons are available to accommodate the needs of users wanting to change the programming of the bed and to move from automatic to manual and vice versa. With the high number of features and functions available, there is also a system of safety “lock-outs” permitting the caregiver to determine the choice and number of functions that bed users may access from their control panel. The program will automatically repeat with the next move being back to horizontal.